The new science building at Whitworth has state-of-the-art laboratories and a cadaver lab. 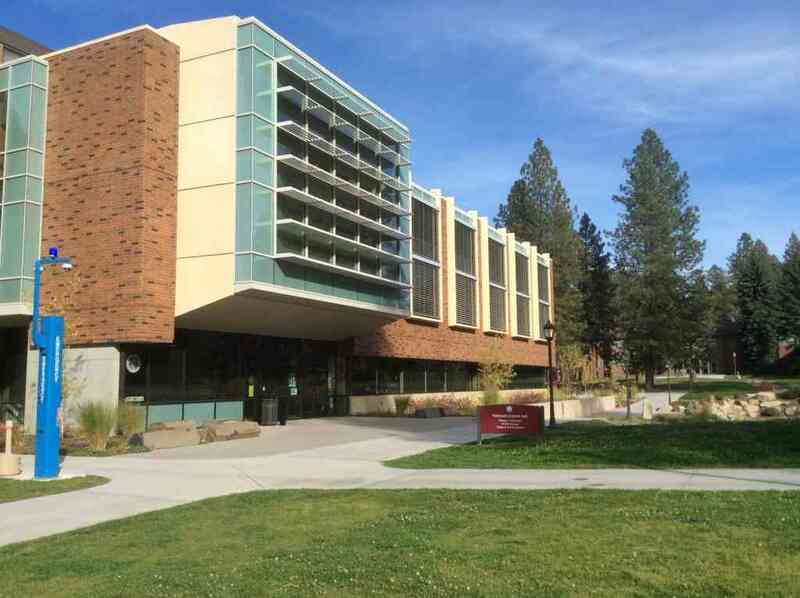 Whitworth University is a small liberal arts college in Spokane, about 15 minutes outside of the downtown area. It is a Presbyterian college, but the vibe here feels closer to a Cal Lutheran (fairly liberal on the evangelical scale) than a Pepperdine. Whitworth asks all faculty and staff to write their own statement of faith, instead of requiring them to sign the University’s statement. Chapel is held twice weekly but not required for students. The general education curriculum requires all students to take three courses, one of which is a biblical literature course. The extensive list of majors is here. 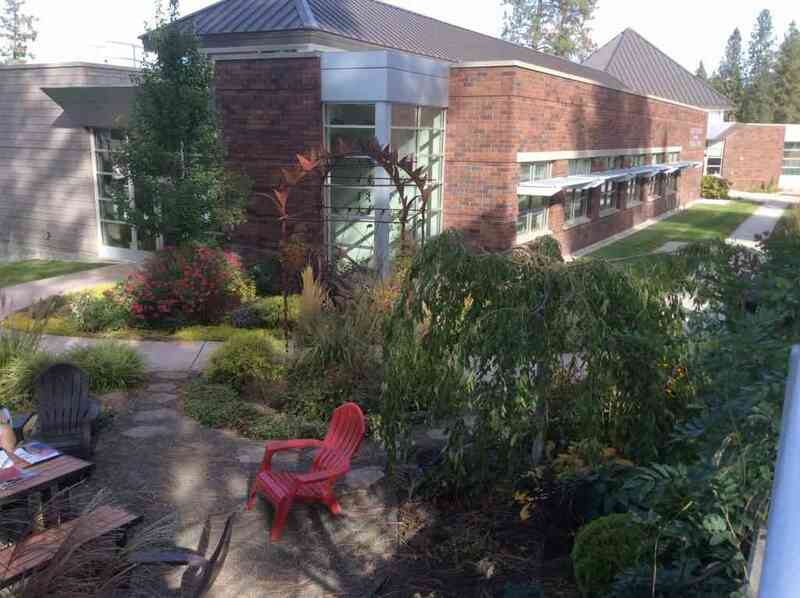 When I visited, Admissions Director Marianne Hansen told me that “students who aren’t good at connecting aren’t going to work here,” because “this is a small and friendly place.” Professors take a hands-on approach to working with undergraduate students here; the student-to-faculty ratio is 11:1. Every student is assigned a faculty advisor/mentor at the beginning of their freshman year. Students talk about their close relationships with professors. The arts complex features a sculpture garden with outdoor study space. The arts are prevalent at Whitworth, with lots of arts and theatre majors. Available majors include graphic design, painting, photo, sculpting, improvisation, theatre – performance track and technical track, and a dance minor. There is a jazz ensemble, a wind symphony, a men’s chorus and a women’s choir. The sciences are also strong here – my tour guide had been pre-med until she did her required 500 hospital volunteer hours, when she decided she wanted to be a physician assistant. Kinesiology and sports medicine are popular programs at Whitworth. Community service is a big part of Whitworth students’ experience; the Office of Service Learning helps students find enriching volunteer opportunities that enhance their classroom learning. The semester system offers a four week January term and a four week May term for students to travel abroad to do community service or take an additional course on campus. Many students get involved in Teach for America when they graduate. Whitworth is very generous with financial aid. The full cost of attendance is about 49k (including tuition, room and board and various other expenses), but basically all students have some form of financial aid, and the average financial aid award for incoming freshman is $31,897. A 3.5 high school GPA will earn you an automatic $14k per year, and a 3.6 plus an 1800 SAT score (that means 600/section) will earn you $16k per year. Whitworth will use weighted academic GPAs on a 4.5 or 5.0 scale. TEST SCORES ARE OPTIONAL at Whitworth; if you choose not to submit your test scores, they will want to interview you (you must have a 3.0 GPA to choose this option). All students must live on campus first two years. There’s no Greek system; instead there are theme houses, like the gaming house and the cookie house. Students apply to live in theme houses, and each house hosts one event per month open to community. With its location just a few minutes outside of downtown Spokane, internship opportunities are abundant. Whitworth provides a warm, welcoming environment for students who want small class sizes and lots of professor interaction.